Over a thousand English books and boxes of teaching aids and manuals are beginning a long, slow journey from London to Burma via Singapore this week, having been collected for poor children in Burma. 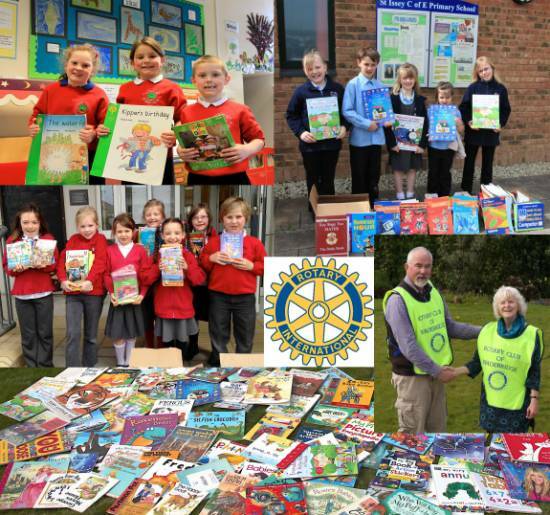 These books have been gathered over several months by Wadebridge Rotary Club, organised by Rotarian Nick Pickles, to be sent to a huge school in Mandalay dedicated to supporting over 6,000 underprivileged and orphan children. Those children rarely see the type of books that are coming their way. They will be enthralled with the bright-coloured illustrations and lively stories of the beautiful children's storybooks that have been donated by generous individuals and schools in Cornwall. As the level of their English improves, they'll be fascinated more and more by the knowledge, stories, atlases and picture dictionaries that British children take for granted. The books will be conveyed to Mandalay by rickety trains and buses to be finally opened up, with huge excitement, in Phaung Daw Oo Buddhist Monastery School, open to any poor children. The books will give enormous pleasure and learning to the children of Burma and will help fill a large library endowed by New Polzeath resident Diana Millington and her late husband, Graham. Warmest thanks and deepest appreciation to everyone who helped to make this happen; particularly Wadebridge School, St Tudy School, St Merryn School, Nanstallon CP School, St Issy School , Wadebridge Foodbank, Nicola Trzaska of Stratton Bookfest, Debbie Rowles of Wadebridge, several Wadebridge Rotarians and others. Photographs by courtesy of Jane Pickles.